Proud to be in Hershey! When I was about 12 years old, my family took a day trip to Hershey, PA. To be honest, the only thing I remember us doing is going on the tour of the chocolate factory! 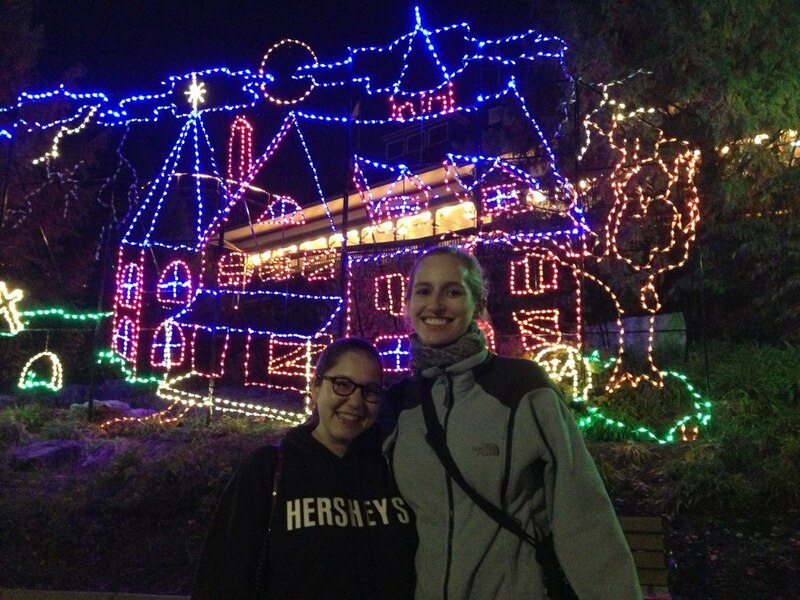 We didn't go to Hersheypark or stay at The Hotel Hershey. So, when I had the opportunity to visit Hershey as an adult and do all the things I missed out on as a kid, I immediately jumped at it! Below, my list of the top 5 musts I recommend for anyone taking a trip to the sweetest place on earth (and a few pictures along the way!). 1) Stay at The Hotel Hershey. If you're planning an overnight in Hershey, there's really no better place to stay than at this luxurious hotel. You can find multiple restaurants, the uber-decadent spa and so much more. Rooms are oversized and contain some of the softest, most comfortable beds I've slept on in quite some time -- not to mention a bevy of deliciously scented beauty products that will clean and scrub you from head to toe. Obviously I didn't work out in this outfit! Or did I? The hotel also offers a fabulous workout facility (which, okay, I didn't use, as you can see from the photo above), hiking trails and so much more. Plus, everyone on staff is extremely friendly and helpful, and really want you to have the sweetest time possible! For more information on the hotel and to book a stay, visit thehotelhershey.com. I'm a huge fan of amusement parks, not to mention roller coasters, so I simply had to check out the park while I was in town! And it did not disappoint. While Skyrush, the park's biggest thrill ride, was closed the day I was there, I still had plenty to pique my interest. My favorite ride was The Great Bear, an inverted steel roller coaster that loops you around as you hang from the track. It's exhilarating but not overly scary. I loved that all of the rides were Halloween-themed while I was in town -- and the park does fun stuff like that year round! Find times, ticket prices and more at hersheypark.com. 3) Visit The Spa At The Hotel Hershey. You can read my in-depth post on the spa here, but it's worth mentioning again just because it's so darned amazing! Every treatment is divine, lunch at The Oasis is a must, and they even offer treatment packages combined with overnight stays. Extremely happy to be eating my Nathan's hot dog! 4) Have a hot dog at Nathan's in Hersheypark. Yes, another park idea! Nathan's hot dogs are simply the best, and when you add in fries (or bacon cheese fries, like my friend Liz got), it's a must. Just make sure you eat your hot dog after riding all the crazy coasters! 5) Have drinks at the Iberian Lounge in the hotel. Liz and I went here both nights, and we absolutely loved it. The fireplace gives off a warm, inviting feel, and the bartenders are eager to bring you delicious drinks. And as a bonus, it's Hoppy Hour between 4:30-6:30pm -- which means you get daily draft specials for only $3! Or you can indulge in The Hotel Hershey Signature Martini, which is crafted with a delicious blend of 360 chocolate vodka, vanilla vodka and white creme de cacao.